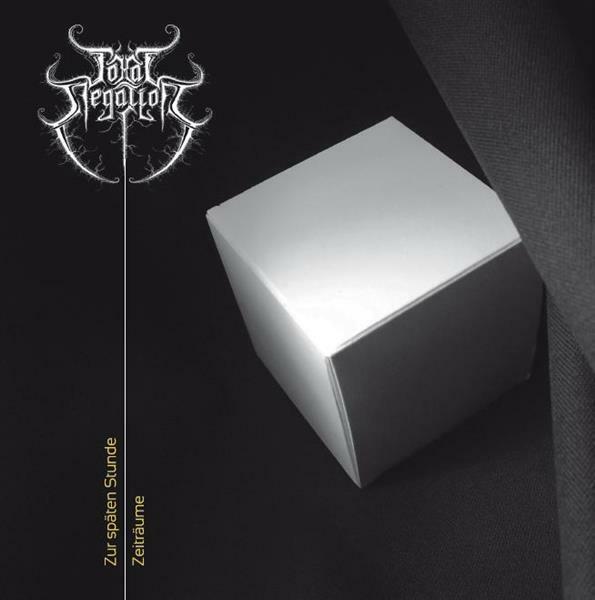 Total Negation’s take on the ‘depressive’ black metal style has a distinctly Teutonic misery about it, particularly similar to their fellow countrymen Wigrid in their use of weeping, mournful arpeggios and use of melancholic progressions dominated by the tremolo strum. The cathartic shrieking of the vocalist is somewhat reminiscent of Rainer Landfermann who sang on Dictius Te Necare by Bethlehem. The sole creator behind Total Negation has an eclectic-minded approach that is similar to his countrymen, shining through in the use of occasional dissonance and alt-rock technique that appears on the Zeitraume tracks, and a use of glockenspiel and accordion that seems to deliberately juxtapose with the direction of guitar, bass and drums. The first four tracks that make up Zur späten Stunde are more orthodox, overall lengthier and are more dynamic in use of tempos. It’s here where the more ‘depressive’ style is more conspicuous, and the doomy opener ‘Einkehr’ actually brings things to quite a promising start. The production job overall is very well balanced and roomy, and the drums have a nicely pronounced thud to them that thankfully hasn’t been subjected to lots of compression. Guitars and bass nicely counteract between one another, rich and earthy in tone, clearly audible and not drowning each other out. This however, does not speak for the overall quality of the release. There are a few poignant moments here and there, though when they try to find momentum in their more straightforward pieces, Total Negation never comes anywhere near capturing the immersiveness or hypnotic beauty that made Forgotten Woods, Mutiilation or early Xasthur excellent. When they’re more eclectic, they don’t have the same consistency and form in composition as the best works by Bethlehem, or the more experimental works by Sigh. Much of this release happens to be quite a mess, never really hitting the spot. It’s a prime example of where the ideas are good in theory but fail to deliver when put into practice.